Thunderbolt ports have reached Windows PCs with Acer's Aspire S5 ultrabook, expanding the availability of the technology beyond Macs. The laptop became available in the U.S. on Thursday and is the one of the early Windows laptops with a Thunderbolt port, which was available until now mostly in Apple laptops. Lenovo is putting the Thunderbolt port in its ThinkPad Edge S430 laptop, which enthusiast website Laptop Reviews is reporting has now become available in Germany. Asus has said it will add Thunderbolt to some laptops. Thunderbolt, much like USB 3.0, is a high-speed interconnect that facilitates data transfer between PCs and peripherals like external storage devices and monitors. However, Thunderbolt is faster than USB 3.0, with data-transfer speeds of up to 10Gbps (gigabits per second). The technology is also attractive as it can daisy-chain up to five peripherals. 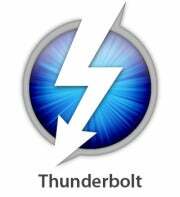 Thunderbolt was co-developed by Intel and Apple and after an exclusivity period to certain companies the technology was made widely available to PC makers. But the lack of peripherals available for the technology has been an issue with the PC makers. Intel in late April said only 21 peripherals based on Thunderbolt were available, but that 100 devices would be available by the end of the year. Intel has said that the use of Thunderbolt in Windows computers could catapult adoption of the technology, which could benefit Macs and PCs alike. Nevertheless, Hewlett-Packard and Dell have shied away from the technology until it goes mainstream, sticking with the widely used USB 3.0 instead because of the wide number of peripherals available. Intel has insisted that USB 3.0 and Thunderbolt can coexist, and Apple has installed USB 3.0 and Thunderbolt ports in its latest MacBook Air and MacBook Pro laptops introduced earlier this week. But Thunderbolt is considered expensive, with peripherals cables priced at a premium. Data-transfer rates for Thunderbolt, however, are expected to get even faster, with a slow shift from copper to fiber optics inside the cable and the move to PCI-Express 3.0. Intel is eyeing a successor to the current Thunderbolt that can transfer data at 50Gbps. The Acer Aspire S5 ultrabook was originally announced at the Consumer Electronics Show in January. The thin-and-light laptop is 14.99 millimeters at its thickest point, and has what Acer calls a "MagicFlip I/O Port," which pops out to reveal Thunderbolt, USB 3.0 and HDMI (high-definition multimedia interface) ports. The ultrabook comes with Intel's latest Ivy Bridge Core i7 processors and 256GB solid-state drive. The Thunderbolt port supports DisplayPort to attach high-definition monitors, and the laptop supports multiple displays, Acer said in a statement. The S5 has a 13.3-inch screen and offers 6.5 hours of battery life. It comes in one configuration and is available for US$1,399. Acer did not talk about worldwide availability.